My Secret Hideout is not a game. It is an interactive toy... or rather poem... or artwork... 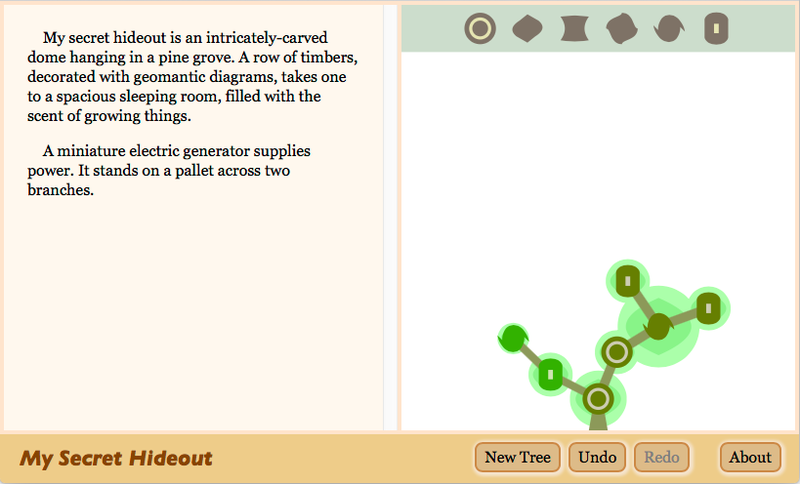 It's an interactive textual art generator set in a treehouse. Play around with it! Drag leaves down and attach them to the tree. 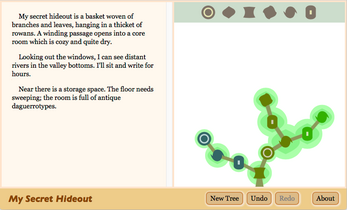 Every time you add a leaf, the description of the treehouse grows and changes. The changes are random... aren't they? Update, Feb 16: The drag action wasn't working right on some Linux browsers. Or maybe it wasn't working right on touchscreen-enabled laptops? Anyway, I've gone over the event code and it should be working better now. I originally created this toy as an iOS app in 2011. Apple recently removed it from their store (because I never updated it) so I've reconstructed it here as a web app.